“To fashion, to his ability to read the daily life and the energy that circulates around us. 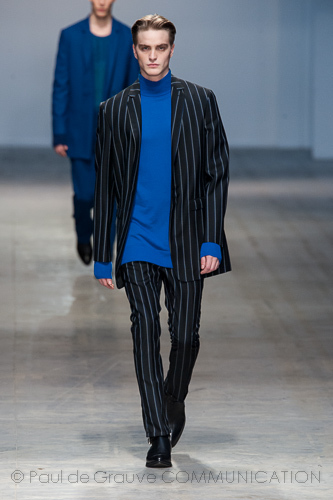 Through the intuition, you can pick up feelings and items, which have freshness and energy, to create a project through the use of fabrics, colors and shapes”: this is the motto of Ennio Capasa, designer of Costume National, that has trodden the Milan catwalks on the first day of the Men Fashion Week. This year Capasa has shown again to be able to keep up with the times, thanks to the combination of fashion and music, which belongs to him. His collection is inspired by the british singer David Bowie, in particular, to three of his albums, created in Berlin between 1977 and 1979: Low, Heroes and Lodger. The theme is about the travel and the change. The fashion is an adventure to live every day, always remaining carefull to the starting point: the rock and roll of the 70’s. Costume National expresses everything with boldness, but always very smart. 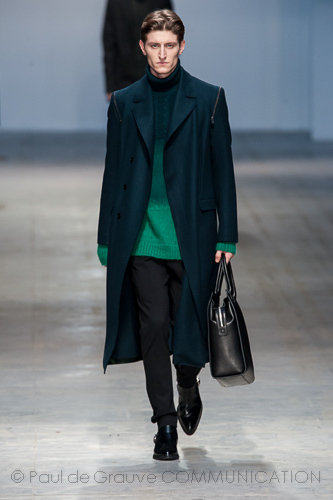 Bottle green, deep purple, burgundy, blue and black, are the collection’s color. The fabrics used, including cashmere, silk, eco-fur and technical materials, reflecting the sophistication of this line, designed with technological minimalism. Fabrics cutted with the laser and sewn to create long coats, leather biker and zipped rams, accompanied with skinny pants or shaped biker. From the world of music, the designer takes ispiration to create new urban silhouette while keeping an eye on the past. Watchword of Costume National’s designer: evolution.